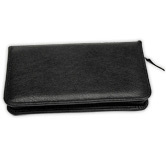 An elegant monogram is the perfect pick for your checkbook. This selection features an eye-catching letter 'X' encircled with stylish scrolls. The decorative design is available in all 26 letters of the alphabet - from Anderson to Zigler! If you'd rather choose a different style of personal check, you can still add the monogram of your choice to the top-left corner during the personalization process when you checkout. Whatever you choose - side-tear checks will provide you with a product that's incredibly convenient. Forget about those annoying accidental rips. 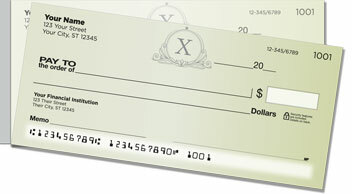 A shorter perforation makes it easy to pull checks from the pad while avoiding waste and embarrassment. Get your very own X Monogram Side Tear Checks now! Order them with matching mailing labels.